Craftivism collective is a group of individuals who promote the positive changes they would like to see in the world through art. They currently have many different prejects which entail you to consider the values of creating something new or promoting something new in order for a complete final outcome. An example of this is ‘stitchable change makers’. The idea behind this is a dot to dot with a slogan that you reflect upon when you stitch. The final outcome is a line stitched image of a ‘change maker’ and how they initiated the change they made through the challenge. Therefore for individuals to appreciate the changes and benefits that go on in aid of change, a thought process needs to stem from somewhere; hence the use of stitch. Reflacting upon this within the fashion industry, a movement like this can enhance sustainable approach to fashion, as it can create consumer awareness of what it entails to produce an item of clothing which they aim to only use twice. This project is on the theme of sustainable fashion and intends to explore consumer behaviours and there attitudes towards fast fashion. 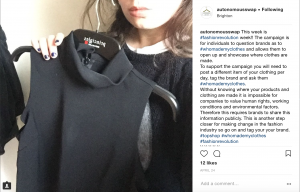 The aim is to create conversation with those who purchase into fast fashion and question they are really aware as to what they are purchasing in too. We are all guilty to purchasing into brands for the aesthetic and price and tend to not give any further though where our products are made, how they are produced and the impact on our people and planet that they have. Exploring attitudes of individuals psychological behaviours towards there buying habits and the knowledge they have surrounding sustainable fashion and wellbeing allows us to join the mission and educate those as the fashion industry in not as transparent as we wish. Clothes are essential to build a personal identity and socially differentiate ourselves therefore through this research it is important to find a way in which responds to peoples needs for trendy clothes and consuming; however more consciously. Kering is a luxury global group that develops on creativity in a sustainable and responsible way by driving towards higher levels of social, ethical, environmental and economical performance. They are convinced that sustainability can ‘redefine business values and drive future growth.’ This means that they vision sustainability to become a luxury component of every fashion house which is most likely to be copied by highstreet retailers. As sustainable fashion is such a hot topic across the industry due to organizations trying to help protect our Earth and Environment. Monki has created a global sustainability campaign which promotes only using 100% recycled or sustainably sourced materials by 2030. It has been created to empower consumers to lessen there impact on our planet. Alongside this they have created a video which they state that “By focusing on what consumers can do, and how Monki’s own work supports the statements made in the campaign, the band wants to empower the viewers to fee they can have an active role in the future of sustainable fashion,” With campaigns by highstreet retailers being created it shows a positive future for the sustainable mission as more brands and companies are become aware of the impacts. The powerful imagery shown below display how sustainable fashion is fun, quirky whilst remains following the brands aesthetic. Through this campaign they are showing how 95% of clothing can be recycled.in a contemporary way that still appeals to there target demographic. Patagonia have ensured sustainable and ethical values are at the heart of there ethos for the past 40 years. They support grassroot activists to find solutions for environmental crisis that the fashion industry partakes in. Patagonia are a prime example that take full responsibility and care of there product lifecycles ensuring no negative impact on the environment whilst ensuring safe, fair, legal and humane conditions are met across supply chains. Across there communication platforms, Patagonia have put in place petitions to fight for preservation of to governments for world Heritage protection. This is a great way to spread awareness of the current issues that our planet faces and acts consumers to act upon it. It also promotes how other companies like Patagonia can follow in the steps through engaging consumers on current issues whilst protecting and facing the these universal issues. Global fashion Agenda have called upon both highstreet and designer brands to take responsibility of the way they’re products are created through changing production processes. The 2017 Fashion Summit in Copenhagen created awareness of the negative impacts it has on the Earth therefore were able to get signatories to commit to the 2020 action plan. Action 4: Increasing the share of garments made from recycled post-consumer textile fibres. Signatories commit to setting targets in one or more of these four action points for 2020 and to annually report on their progress. Global Fashion Agenda will support the brands in implementing the commitment through knowledge sharing, policy engagement and by facilitating industry alignment. Brands including within this plan are Kering Group, H&M, Zara, Hugo Boss, Zara, Tommy Hilfiger, M&S e.t.c. At Copenhagen Fashion Summit 2017, Global Fashion Agenda called on brands and retailers to sign a commitment to join the transition to a circular fashion system. Trend change is dictated by celebrities who lead our culture to want new clothing all the time. This is due to there luxury garments showcased all over media publications and individuals with less disposable income have a desire for that clothing. Therefore high street retailers feel obliged to create cheap copies from unrecyclable materials with a short product lifecycle just to meet consumer need. However sponsorships on social media sites such as instagram and Facebook are now put in place with celebrities to promote there products. This marketing strategy is extremely unsustainable as it increases demand for fast fashion clothing. However it also encourages an insecure mindset within ourselves as we want to follow trends and the best way to look as we follow the celebrity dress. 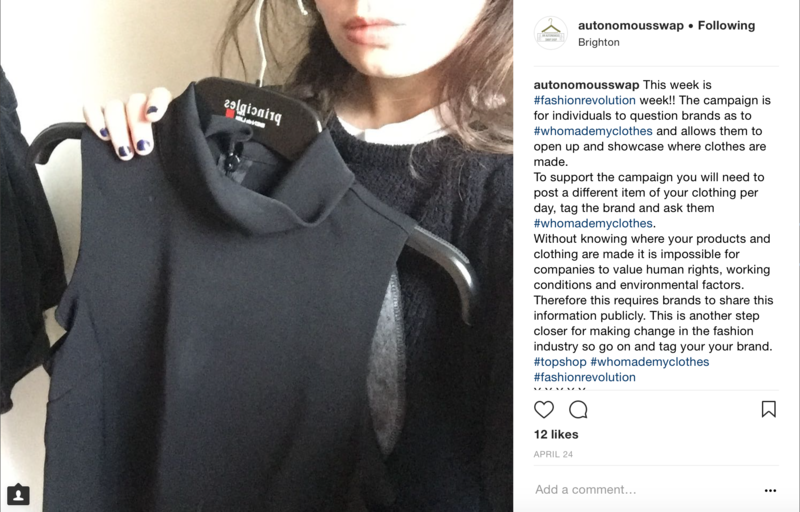 Fashion Revolution Week occurs once a year across the world, it is a campaign is for individuals to question brands as to #whomademyclothes and allows them to open up and showcase where clothes are made. To support the campaign you will need to post a different item of your clothing per day, tag the brand and ask them #whomademyclothes. Without knowing where your products and clothing are made it is impossible for companies to value human rights, working conditions and environmental factors. Therefore this requires brands to share this information publicly. This is another step closer for making change in the fashion industry so go on and tag your your brand. The statistics show how more people are interested in where there clothes are made as this has not ceen such an issue raised prior to the 21st century. This is due to the fast fashion industry exploiting workers and creating a toxic environment. As the world develops social consciousness is becoming prevalent therefore organic and ethical clothing is vital for global change. This is a good movement that is happening as more people are becoming aware of the negative impacts of fast fashion and what this has on future generations.